As a result of the racist messages and graffiti that appeared around campus last week, the SUNY New Paltz community response has been swift and unified in denouncing the behavior. Two on-campus events have also been scheduled to address the situation. The first, held Nov. 17, was sponsored by the Black Studies department and the Student Association, with discussion being led by Jonathan Espinosa, a third-year Black studies and sociology major. The second, being held November 30 at 7 p.m. in the MPR of the Student Union, was set up by Christian and Student Association President Terrell Coakley, and will be more of an open forum than a lecture. The heated reaction to the incidents is in part over speculation that this was no simple prank, but a concerted effort to start a “race war.” These rumors have been circulated through social media and blogs after an anonymous Tumblr account, titled The Smoking Gun, released photos and news of the incidents before any news outlets. The Tumblr was so overwhelmed with negative reaction that it has since been deleted, but only after being reblogged over 200 times. Here is a screenshot of the post. 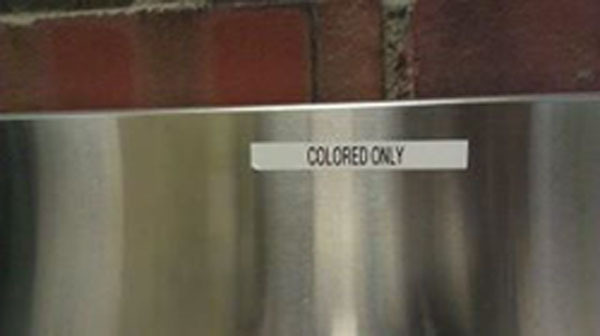 Since the discovery of a “colored only” sign above a water fountain on November 8, a day after the campus-wide Black Solidarity Day, and initial reporting of the story here at The Little Rebellion on November 10, the Associated Press and subsequent other papers have picked up and ran with the story, putting SUNY New Paltz under national scrutiny. For continuing coverage of this story and a glimpse at just how much attention it is getting nationwide, check out our storify!